Australian pay TV operator Foxtel have revealed a new way for people to consume their content, with the release of their new ‘internet pay-TV’ platform Foxtel Play. Aiming to provide an online alternative to cable or satellite TV that requires nothing but a strong broadband connection. This feature will enable the internet service to be accessed via a range of connected platforms (so far enlisting PC, Mac, Xbox 360 and ‘eligible Samsung smart TV sets’ as inaugural carriers of Foxtel Play). The company have explained that a key difference in the online platform is as opposed to the regular service which requires users to commit to a ‘lock-in contract’ of predetermined length, Foxtel Play is a monthly ‘pay-as-you-go’ offering. However, that payment will not be one which viewers choose to pay for on a whim, as although Play offers viewer customization through four ‘streaming packages’ (documentary, drama, entertainment, and kids), subscribers will need to pay a base sum of AU$25/month to stream one of those packages, rising to AU$35 for two, AU$45 for three and AU$50 for four, with the separate additional options of sport and movies each costing another AU$25 for those who choose to implement them, meaning a monthly expenditure of AU$100 (US$90) for the chance to have the ‘complete set’. For something that offers just over 40 ‘live channels’ (headlined by the Fox Sports brand, National Geographic, Lifestyle, and FOX8) in that complete set, this will undoubtedly be seen as a little expensive for a TV package (or six), but Foxtel maintain it will be of benefit to users who cannot access ‘cable or satellite connection’. Included in the subscription will be access to Foxtel Go for on-demand versions of subscribed programming through smartphone and tablet computers, with the added right to ‘tether two additional devices’ onto their subscription. In other news this week, Foxtel could be set to irritate a further minority of their user base after announcing their withdrawal from the 3D TV market, with their dedicated channel #201 shutting down on 27 August due to a lack of public interest in the new technology. A move that has also been taken by British public broadcaster the BBC. The Fetch TV IPTV service has added ABC’s Australian catch up TV service iview to its lineup. 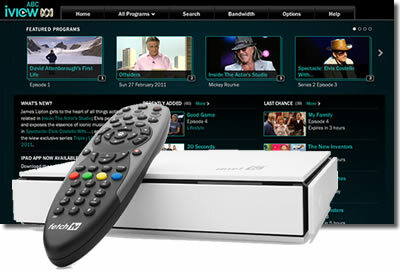 The free iview service can now be seen on the Fetch TV main menu. The iview service is becoming ever popular in Oz and recently broke record for the number of requests from connected devices. The service offers ABC (Australian Broadcasting Corporation) streaming content on-demand at anytime, and is one of the most downloaded apps in Australia and New Zealand. UK broadcasters Channel 4 have joined the small ranks of content providers around the world that now include an official ‘download’ feature for their online catch-up TV service, yesterday (25 July) revealing the new feature for their app version of the ‘4oD’ service. The promise of ‘free downloadable catch-up content for mobile offline viewing’ is the leading feature of a new update on the service, the first time such an option has appeared on a UK commercial broadcaster, making Channel 4 the second overall in the region to implement one, after the BBC’s long-running similar feature on the popular iPlayer platform. In a similar manner to the BBC’s offering, viewers of 4oD on mobile and tablet computers will be able to choose from the last 30 days of programming on Channel 4’s networks as before, with the addition of a ‘download’ setting that will enable that video to be saved to the device, with a 7-day limitation to watch the content before the file ‘expires’. As with before, the 4oD app is available to all ‘registered Channel 4 users’ using iOS or Android products, and will look to become at least the second-most notable provider of show downloads in the UK, with satellite broadcasters Sky currently offering a ‘watch offline’ feature on their Sky Go platform, but charging their subscribers an extra fee for the privilege. 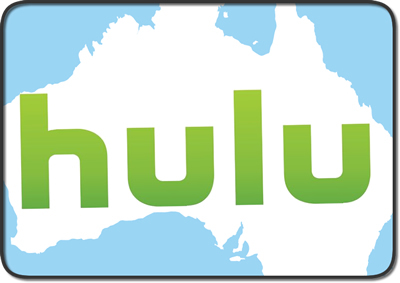 Australians already have a pretty good selection of catch-up TV networks to choose from, but pretty soon they may be able to watch a lot more US recent hit TV shows, as Hulu could finally be looking to make an entry into the Aussie market. And if that’s not enough, Vdio which is the video offshoot of Rdio could also be heading down under. The rumors are flying around thanks to trademark website TM Watch. The website reports that both companies are trademarking themselves as a streaming and downloading service, while Hulu is also registering it’s brand for a few additional classes. Australians are already familiar with local catch-up services that including Foxtel Play and iView amongst others. Although these site will be pay offerings in the style of Netflix (which is yet to launch in Oz) and would be more of a threat to commercial offerings such as the Quickflix service. The story could still amount to nothing though, back in 2011 Hulu registered a bunch of International trademarks including Australia, but all has been quiet in the preceding two years. For the time being, both services are unavailable in Australia, but the most recent move may indicate the companies are planning to launch locally now or in the future. The Hulu on-demand service which has been launched as the pay-to-watch Hulu Plus outside the US, offers full seasons of TV shows and movies for a monthly subscription fee of US$9.95. 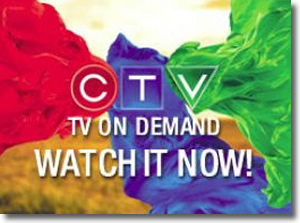 The service has over 50k shows and several thousand movies available for instant streaming. The owners of Hulu have been toying with selling the site, but have now decided to invest and expand while growing the 4 million subscriber numbers instead. The Vdio service was launched for US and UK users back in 2011 ( although launched for premium Rdio subscribers earlier). Vdio is not a subscription service but offers options to rent and/or buy from a library of ‘thousands’ of new and classic titles. The trademarks are currently indexed but will take 3 months before the are formally registered. Maybe Australian internet TV viewers can look forward to a content filled Christmas? It seems that Canadian TV viewers are turning to the internet for video consumption, as more of the population dump the traditional TV. According to a Comscore report, 16% of adults in Canada are streaming all of their video content from the web. The trend of abandoning TV for cheaper internet TV has been dubbed as “cord cutting”, and is more popular amongst the younger and more technically savvy demographic. The report which was commissioned by Google (who some cynics may say would manipulate figures in their favor), also found that 35% of respondents watch a mixture of internet content and traditional TV. It is not all bad news for the TV industry though as 35% are only watching traditional TV. But the internet seems to be where the Canadian population are heading as the survey showed that Canadians are watching around 2.9 billion videos on YouTube each month, or per person around 127 videos monthly. The report confirms that the web is the new home of TV for Canadians after 19% of respondents said they would be watching more internet TV in the future, whilst only 6% said they would watch more TV. The survey also asked what were the main benefits for both web and traditional TV. Respondents said that traditional TV was easier to watch, had the better picture quality and better viewing experience, whilst online TV was cheaper, more convenient and offered more interaction. The long-running saga regarding whether or not Hulu will sell themselves looks to be nearing its climax, with three bidders for the streaming site noted as having put official offers on the table to co-owners News Corp. and Disney. The interested parties are noted as service provider AT&T working alongside the Chernin Group, DirecTV, and Guggenheim Digital Media alongside private equity firm KKR & CO, all of which are recognised as having placed bids of ‘over $1 billion’. The companies that have reached this stage of the process were reported by ‘people close to the matter’, with further rumours suggesting that once the Hulu-set deadline for bid finalisation is passed, a deal with the triumphant buyers could be completed within ‘a week or two’. With the decision soon to be made by the site’s executives, and one that presumably will not fall through like the failed attempts to offload the service in 2011, the prize at stake for the new owners will be the second-biggest video streaming site in the USA (alongside a sizeable presence in the Japanese market) that currently carries annual revenue of $700m, gained from an estimated 4 million subscribers (at rates of $7.99 a month) and selling advertising that airs to its many more non-paying viewers. The price tags being touted are said to be confirmation that all three parties are deadly serious of taking on and managing Hulu, and with $1b are more than likely to treat their new property with a level of interest that News Corp. and Disney are looking to do without, instead seeking to cashing in on their shares of the site after disagreements with eachother on how to run the platform. Unless it is the single solo party DirecTV who win the bid, will the new owners manage to co-operate more harmoniously in taking Hulu forward than previous regimes managed?